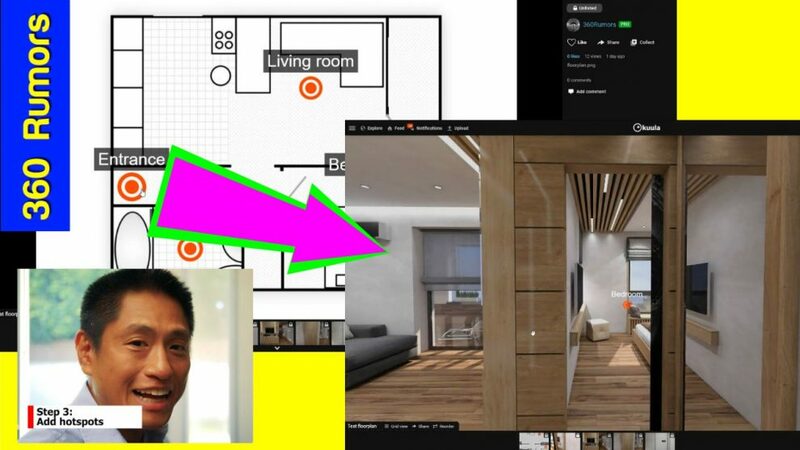 Here’s how to add a floor plan to your virtual tour, with no programming required. Many clients want to have a floor plan in their virtual tour. It makes navigation easier, and helps the viewer to better understand the layout of the property. Here is a sample virtual tour with floor plan. The floor plan has hotspots to take you to the rooms. There are many ways to add a floor plan to a virtual tour but some of them can be complicated or time-consuming. Here’s a way to add a floor plan to a virtual tour in just 3 steps, using a website called Kuula. 1. Upload the 360 photos. Login to to Kuula and click on “upload.” In the Upload menu, choose the option “Create Tour.” The 360 photos can be batch uploaded to save time. 2. Upload the floor plan. From the main menu on upload and select “Regular image” to let Kuula know that you’re uploading a non-360 photo. If you don’t have a floor plan, you can create one using sites such as this one. 3. Add hotspots. To add a hotspot, open the floor plan, click on Edit, and select Hot Spot. For each Hot Spot, you can customize the appearance, and add a label with customizable color and opacity. After creating a hotspot, go back to the main editor and click on Hot Spot again to add another hot spot. After adding all the hotspots you need, then click on Close and Save. That’s all there is to it! You can share the URL, or the virtual tour can be embedded in websites and in MLS systems that allow external links. Kuula has a free account but virtual tours require a Pro account at Kuula. A Pro account costs $8 per month for an unlimited number of tours. Thanks that looks a great software, is the floor plan in jpg or PDF? Also when you complete the project, is the floor plan there all the time or can you have the option to show the floor plan or hide it?